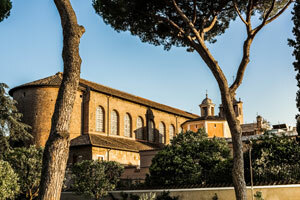 The area of Rome located between the Archbasilica of St. John Lateran and via Appia is easily reachable by public transportation, rich of beautiful churches and stores. It’s the ideal area for a vacation spot in Rome. It allows you to reach downtown rapidly by subway and at the same time spend pleasant time among cultural experiences, shopping and walks in the nature. San Giovanni in Laterano. The Archbasilica of Saint John Lateran is without a doubt the main attraction in the neighborhood. Not only is it the oldest of the four major papal churches, but it’s also the oldest in the whole western world. It was built in the IV century. The beautiful baroque Church features a majestic external facade with on top statues of Jesus, St. John the baptist, St. John the evangelist and the 12 apostles. The namesake square features the tallest monolithic obelisk in the world. It’s 32,18 metre tall and reaches 45,70 metres at the top of the cross. Next to the basilica the Scala Santa stands stall, made by 28 steps, that according to tradition, Christ climbed to meet Ponzio Pilato. It’s supposed to have been moved to Rome in 326 by the Empress Santa Elena, mother of Costantino I.
San Clemente Basilica. If you’re staying nearby, don’t miss out on the San Clemente basilica. It’s a a ten minute walk along Via San Giovanni in Laterano or Via Labicana. Inside you will admire the mosaics of the Triumph of the Cross in the apsis, the Renaissance frescos of the Santa Cecilia’s cappella and the archeological digs (Entrance 10 € and reduced 5 €). Terme di Caracalla. 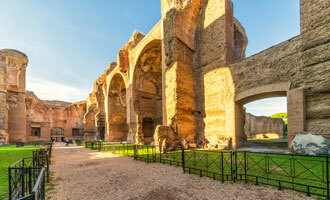 Open in 216, The Terme di Caracalle (thermal baths of Caracalla) were used by romans for 300 years up until the Visigoths destroyed the aqueduct that carried the water there. You can see the calidarium, tepidarium, frigidarium and the natatio. On the sides you can check out the ruins of the two gyms where the romans would work out before jumping in the water. Further information on opening times and ticket prices on the Coopculture website, in the section dedicated to Terme di Caracalla. Walk on Via Appia Antica. The San Giovanni neighborhood, whose official name is Appio Latino, allows you to take pleasant walks in the nature and in its history filled surroundings. Along Via Appia the path takes you through patrician villas, catacombs, monuments and defense structures. You can find the recommended itinerary on the Appia Antica Regional Park website that provides opening times of monuments and museums. Via Appia Nuova. Compared to other areas of Rome, the San Giovanni neighborhood allows you to shop at reasonable prices. Via Appia Nuova features many clothing stores, footwear, handbags and whatever you wish to purchase. At San Giovanni subway stop you will find Coin, that is a good shopping spot on a rainy day especially because you can stay inside away from the rain. Via Sannio Market. Every morning, save for Sundays, the Via Sannio market is open (near San Giovanni subway station). It’s strictly a clothing market. There you will find new clothes as well as used clothes, shoes, handbags, belts, military style pieces, all ranging between 2 and 10 Euros. Negotiating the price is a must. Keep away from the shady people at the entrance trying to scam you with the old three-card trick. May 1st. May 1st is labor day in Italy and the area right in front of the San Giovanni’s basilica hosts the May 1st concert, an event that features many italian and foreign artists. Coming out and gay street. In Via San Giovanni in Laterano, very close to the Colosseum, you will find Rome’s gay street: a 300-metre pedestrian area where you can walk, shop, taste the roman cuisine and hang out in a gay bar. The most popular spot is called Coming Out open from 7 am to 2 am. Are you looking for a restaurant? San Giovanni has plenty to offer: local pizzerias, trattorias, vegetarian and vegan restaurants, winehouses. There are also pastry shops and neighborhood landmarks. Pompi’s tiramisu. In Rome if you say tiramisu the first thing that comes to mind is Pompi, the self proclaimed king of tiramisu. A bar that has specialized in making this dessert. Besides the classic version, they also make strawberry tiramisu, pistachios tiramisu, nuts tiramisu and banana tiramisu. The place is located in Via Albalonga and it opened in 1960. Over the years the business has grown and consequently they also have opened in via della Croce, via Cassia, Viale Marconi and via Cola di Rienzo. Metro: You can get easily to San Giovanni by subway line A. On one direction it connects to Termini station, Spanish Steps and St. Peter’s. On the other direction it basically follows Via Appia Nuova’s path up to Anagnina station. Bus: You can hop on the 81, 85 or 714 lines that swing by San Giovanni’s basilica. Several bus lines run through the neighborhood. Railway: Tuscolana station is a few minutes away by foot from Ponte Lungo station on the A line. There you can find several connections to Fiumicino airport and the main stations of the city. More specifically, the FL1 line allows you to get to Ostiense station, Fiera di Roma and Fiumicino Airport in one direction and to Tiburtina station and Via Nomentana in the other (to get to Orte). The FL5 line instead allows you to get to Termini station, Ostiense station, St.Peter’s, Via Aurelia and Civitavecchia.